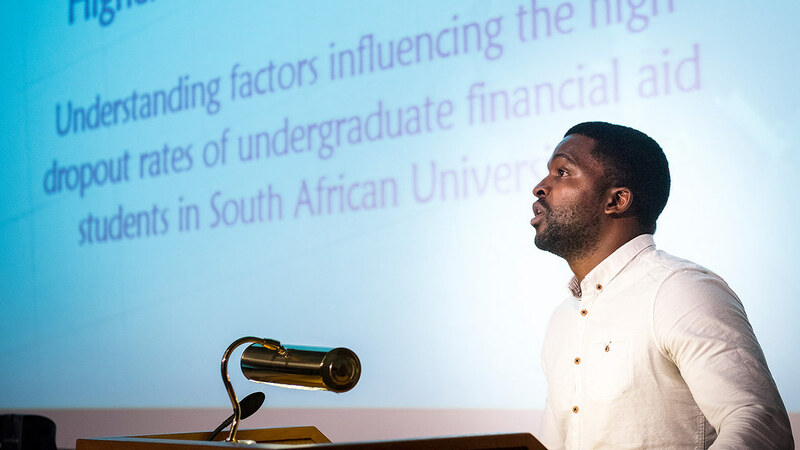 Mukovhe Masutha shares his experience of Bath and how he hopes his PhD research will help widen participation in South African higher education. I was born in Mapate, a village in South Africa’s Limpopo Province. I was born to a family of seven siblings but lived with my grandmother since I was a year old. For most people growing up in rural South Africa, accessing and succeeding in higher education is at the center of the struggle against perpetual socio-economic marginalisation. I was no exception. As an undergraduate, my desire to challenge this reality led me to join student activist movements. Later I was elected President of the Student Representative Council (the equivalent of the Student Union) at my university. This exposed me to the day-to-day functioning of the University and the South African higher education landscape in general. These experiences and a research project I was involved in had a major influence on my decision to embark on a PhD. I searched for top research-intensive universities in the UK and discovered the School of Management’s International Centre for Higher Education Management (ICHEM). ICHEM’s focus on global higher education and Professor Rajani Naidoo’s research attracted me to Bath. With the exception of the weather, it’s been a truly empowering experience. My classmates are great, and the staff very helpful. Bath is very beautiful. My PhD research aims to help better understand the high dropout and low graduation rates of South African financial aid students. Post-apartheid South Africa identified widening participation in higher education as one way to break the cycle of poverty and undo the socio-economic legacy of apartheid. In response to this, the democratic government introduced the National Student Financial Aid Scheme. This provides students from disadvantaged backgrounds with access to higher education. As a result, the socio-economic demographics of the student population have changed. However, this has been met with major shortcomings: high dropout and low graduation rates. These threaten the developmental objectives of a post-apartheid higher education sector in South Africa. Many factors made me want to pursue this research. As an undergraduate, the higher education sector appeared to me to contradict its own efforts towards achieving social mobility. This was of particular concern in South Africa, with an apartheid history of deliberately depriving access to higher education to the majority of South Africans. I hope that apart from the academic contribution, my work will contribute towards the development of policy and intervention programmes. After my PhD, I intend to go back to South Africa and improve the work of Thusanani Foundation. This is a non-profit organization I established five years ago. It aims to bridge the education, information and technology gaps between rural youth and their urban counterparts in order to create an equal opportunity for all to access and succeed in post-schooling opportunities.